Once upon a time we were searching for a McD’s that still had the McRib available and came across something much better – an Italian restaurant with a drive thru! And thus our love of Tutto Fresco began. There is something very cool about being able to get lasagna and hot chewy bread without having to get out of the car or even leaving the house (since Tutto also delivers). Many a cold mucky day has been saved by the ability to have hot tomato soup or chicken alfredo delivered. Quite an upgrade from cheap pizza, but not as expensive as Lunch On the Run or those other restaurant delivery services. 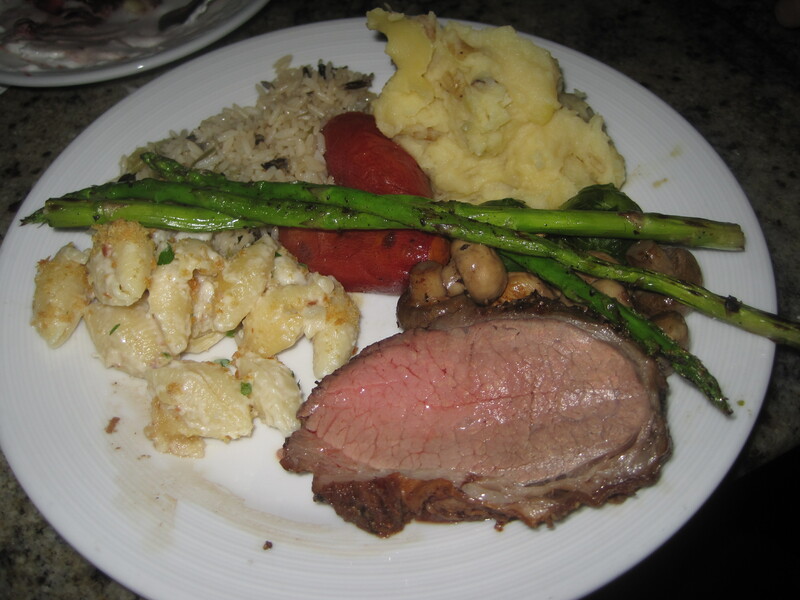 As to the food – these are good portions of familiar Italian fare, similar to what you might get at an Olive Garden, but with a more homemade taste and greater variety of offerings. So far we have tried a sizable amount of their menu and never come away disappointed. Our favorites include their meatballs, which are huge and appear to be laced with melty mozzerella, salmon with pesto, and the lasagna. Every order comes with yummy chewy bread that can be dipped in rosemary infused olive oil. If you get it delivered, they will bring you a whole bag of the stuff. (Not that you should eat the whole bag, but it’s great for sharing amongst friends when getting pizza or sub sandwiches seems boring. With locations in both Orange and Rancho Santa Margarita, you should give them a try! We are really enjoying the themed Junior Mints this year. I mean, it isn’t really a world-changer but they are a nice snack and a good bit of variety from their usual. So far, we have had the Valentines Day Junior Mints (really liked these – thicker filling with a bit more sugar) and the Easter mints (did not like the coating, overall was a thumbs down). So, we approached the Peppermint Crunch with a 50% success rate. 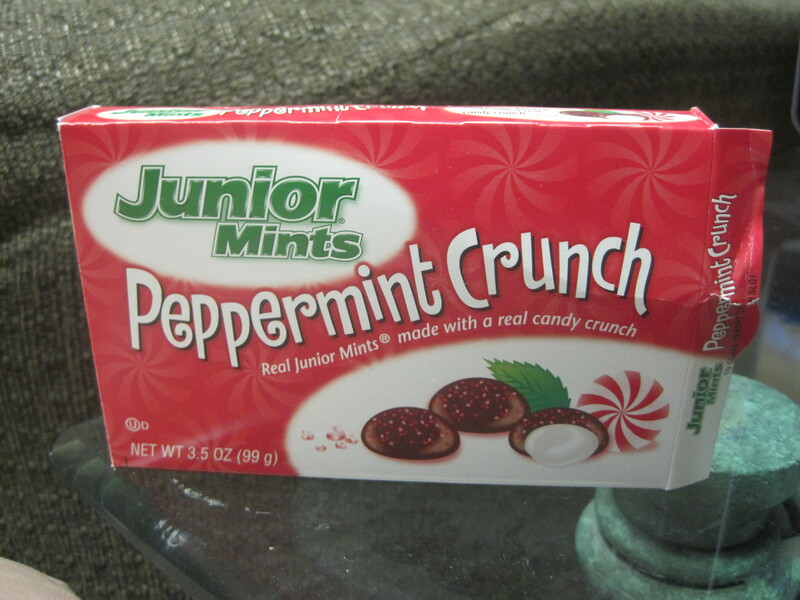 The Peppermint Crunch differed from the others in that they didn’t really change the core formula – they had the normal filling and the normal chocolate coating. However, what they added was a crunchy sprinkling that vaguely related a candy cane in flavor. Not in the sense that they tasted artificial or cloying, but just that it was a slightly gentler taste than you would get from literally eating a Junior Mint sprinkled with candy cane bits. Adding a bit of crunch to a Junior Mint added a lot to the experience (such as it is) of eating them, which didn’t shock me due to our habit of eating them in movie popcorn. They didn’t magically morph into gourmet candies or anything but they were definitely a step up from the normal Junior Mints, with no particular price premium or irritation (unlike the cloying aftertaste from the Easter mints), so I would recommend them heartily. 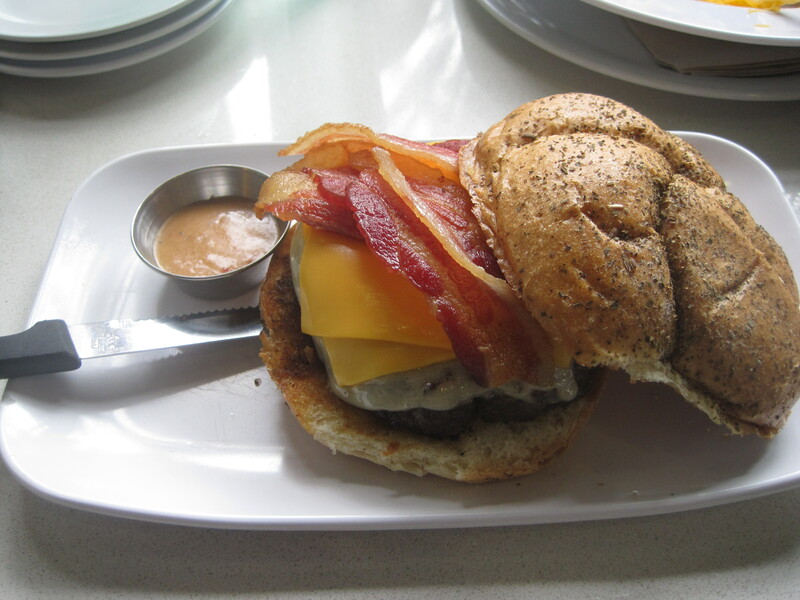 We’ve been hearing about The Counter for a long time, but given our sour experience with Slaters, we were hesitant to try another trendy hipster burger place. Especially one located in the Woodbridge area of Irvine, where Yuppie meets Hipster in a sometimes mind bending fashion. But while, yes, the wild Hipster is absolutely getting his or her burger on at The Counter, I am quite happy to report that there is no snotty attitude to be found in the waitstaff. Our waitress seemed genuinely pleased to see us, even on a busy Saturday afternoon, and was always quick to make sure we had drinks and understood the ordering system. She even brought us an extra round of their wonderful peanut sauce when our daughter lamented that she wished she’d ordered that to go on her burger. Yes, this was going to be a very different experience from Slaters indeed. The reason I compare them is both pride themselves on being trendy places with unusual burgers and an almost identical ordering system, in which you fill out a little questionnaire about your perfect burger. (Or chicken sandwich, in the case of our daughter.) 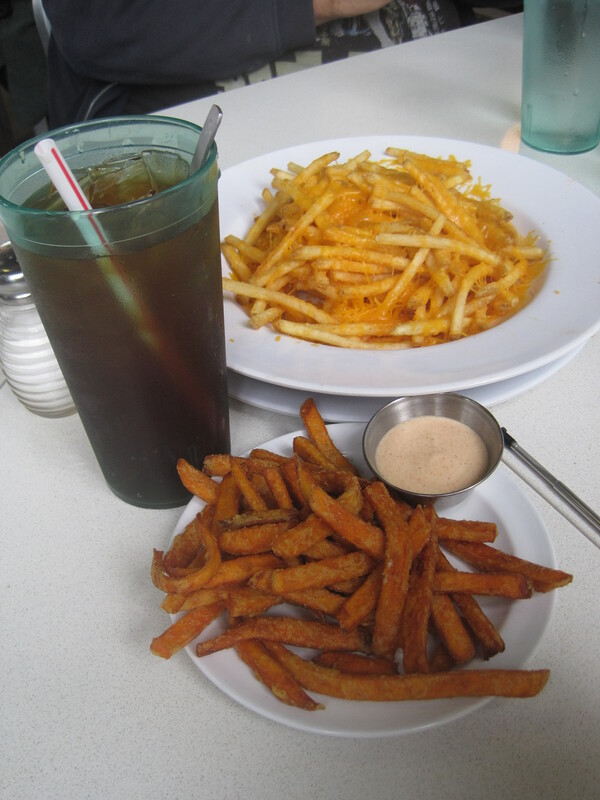 One of the things that made me smile right away is that unlike Slaters you can actually order an individual side of fries for less than $2 – good news when you are the only one who enjoys sweet potato fries at the table. Honestly the side I received wasn’t much smaller than the Slaters one I got for twice as much, so that was awesome. And should you order a full baskets of fries, especially the cheese fries, you will not be disappointed. The order we received was huge, and the fries, while skinny, were amazing. Seriously. I don’t know what seasoned salt they use, but I could eat them all day. I ended up ditching my yummy but nothing to write home about sweet potato fries for a share of the cheese fries pretty quickly. Then the burgers arrived. The presentation is great. The burgers looked sizable and delicious, without being overwhelmed by the toppings. 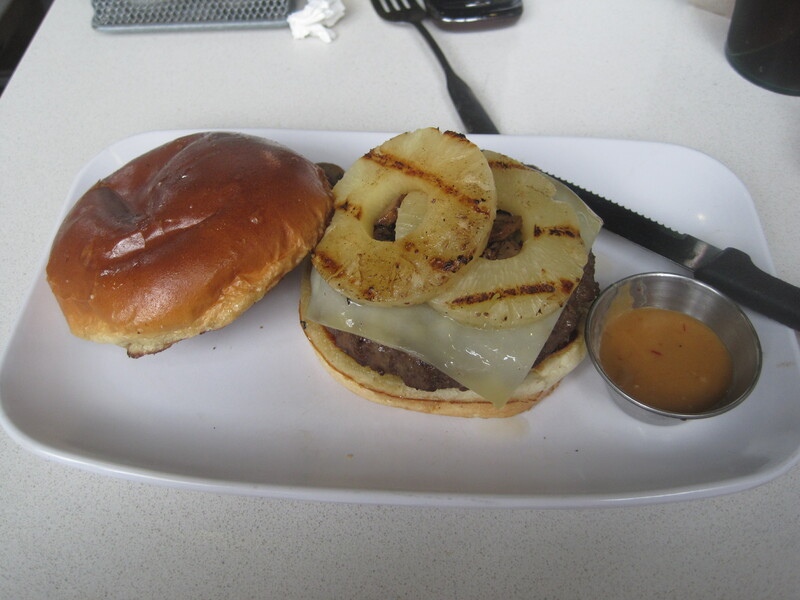 I ordered mine with peanut sauce and pineapple, which ends up giving the burger a nice sweet meets salty spicy kick. The burger is easy to eat and is not completely lost in the bun. I like that they give you the sauce on the side so you can regulate the amount. This the “six dollar” burger Carl’s was telling you about a decade ago. Except now it’s $10. Oh well. Inflation. I’ve cut almost all fast food out of my diet – if I’m going to indulge in a burger it should be a really good burger, and this was a really good burger. Well worth the splurge. I had a bite of the aforementioned chicken sandwich also, and I am please to report that is is an actual breast of chicken and it was also cooked very well – not all rubbery like certain other burger places we have gone to. Overall, The Counter was just a total 180 from our experience at Slaters 50/50 in all the right ways, and I have no idea how Slaters got all those awards without bribing someone. The service at The Counter was fast, helpful, and friendly, plus the food was brilliant. I would come back just for the fries. And maybe to try their shakes. I’m very happy this was one of those restaurants that lived up to its hype. Pink’s Hot Dogs is a moderately famous place, especially in recent years, with the expansions out in Vegas and in Buena Park. I have not eaten at the original Pink’s, but I have eaten their catering once and their Buena Park location once. Fair disclaimers if they are necessary. Pink’s Buena Park has a pretty standard fast food vibe, albeit with a lot more celebrity pictures than you would expect to see in your average mom and pop fast food place. The line wasn’t too bad but, again, being fast food there was no particular service to talk about. Pink’s is pretty simple – other than the fries, there are four basic ingredients: turkey dog, hot dog, chili, and cheese. The hot dogs are good but perhaps a bit odd, at least to my palate. This is due to their having a moderately thick casing, enough to pop when you bite through it. This combined with what at least had a mouth feel of better meat, led it verging on seeming more like a sausage dog than a hot dog. I found this good in small doses but the bacon burrito dog, which contains three dogs and thus three times the casing, started to wear me out after a while. Too much work, though the cheese, chili, and tortilla were all quite tasty. 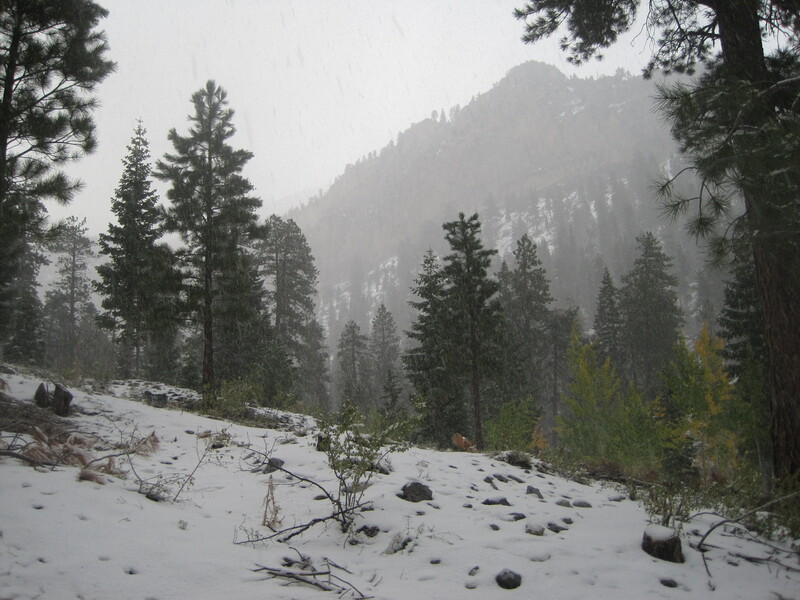 I found myself preferring the turkey dogs – they were tasty and easier to eat, without so much effort in the biting. Now, it certainly isn’t an inherently bad thing to load up on casing and I think a fair number of people actually prefer it, and it’s not really physically difficult to eat – I just prefer a simpler, easier to eat hot dog than the beef dogs at Pink’s, especially when they were packed on top of each other in an appalling but delicious fast food concoction. As a side note, their chili cheese fries were very forgettable. I would definitely take Weinerschnitzel or Tommy’s chili fries instead of these, and I believe they are cheaper, as well. One warning, though – I am not sure if this is exclusive to the Buena Park locale since that happens to be inside Knott’s Berry Farm’s little shopping area, but the prices were quite expensive for what I would really struggle to call anything other than high quality fast food. 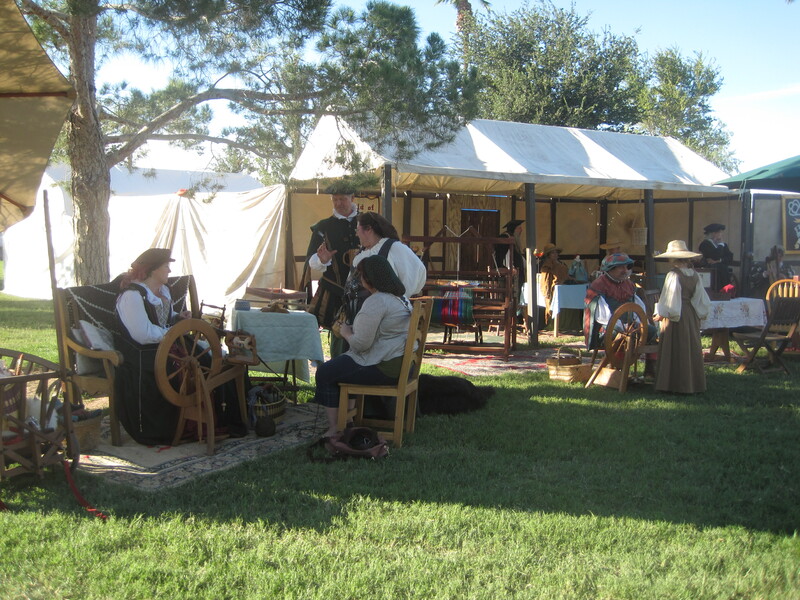 On the plus side, Knott’s actually has a handful of free historical exhibits like Independence Hall and a replica of George Washington’s fireplace, so you can make an afternoon out of it. I believe the original Hollywood location may be cheaper, but in the past when trying to go there the line was literally around the block and I can’t imagine waiting that long for hot dogs. 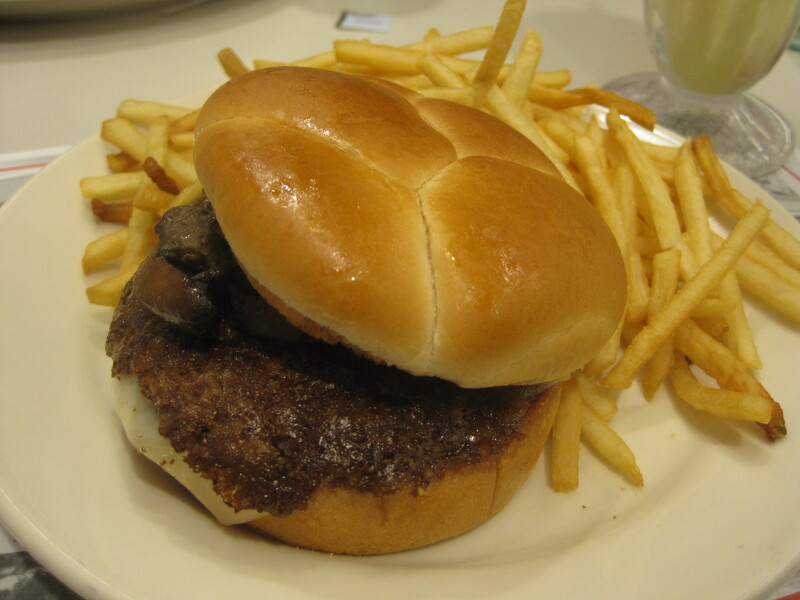 Steak N’ Shake – Mysteries of the Mid West… SOLVED! 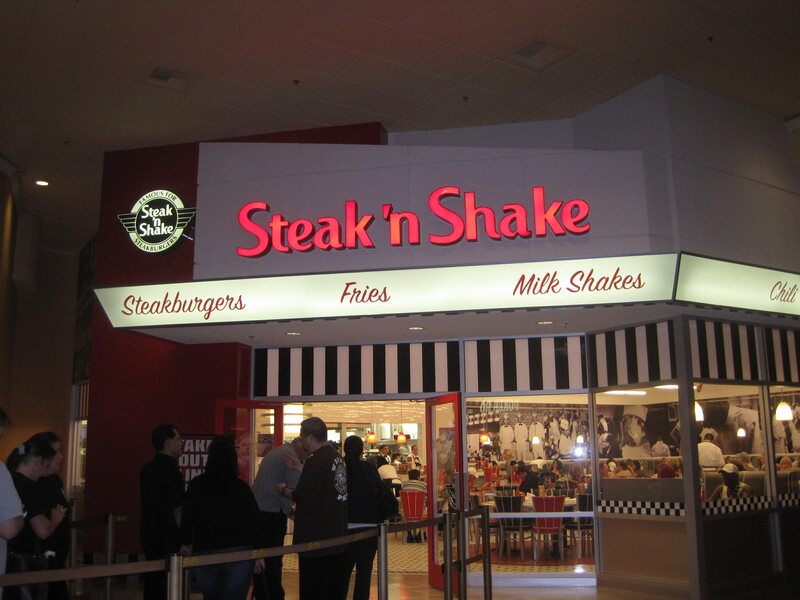 As it so happens the Vegas Steak ‘n Shake is located at the South Pointe, either on your way in or out of Vegas from all points West and South. Thus it is an easy stop off either to end your Vegas traffic induced fasting or as a preparation for said traffic induced fasting. What to look for in the casino. First off, you are warned there may be a line. Go at an off time and you will be spared the wait. 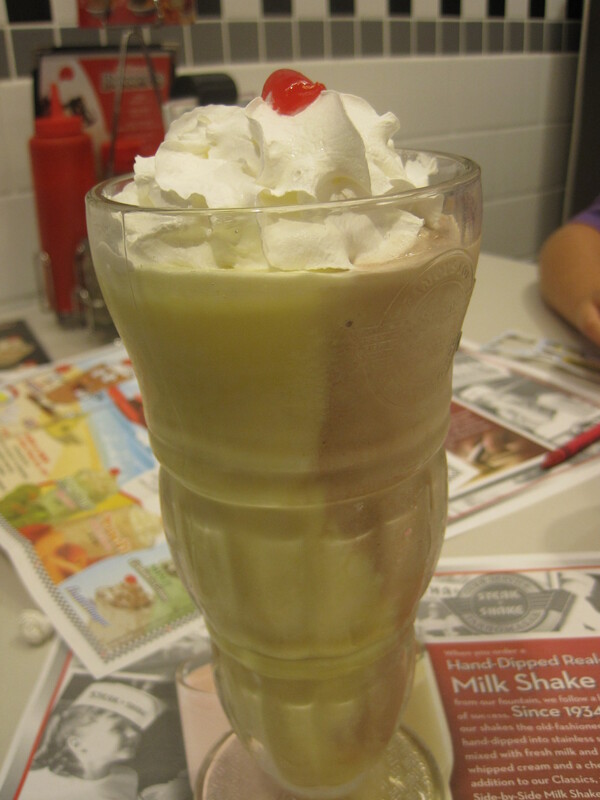 Once you are in, the Steak N’ Shake resembles a 1950’s diner, as mandated by the unofficial All American burger joint code. (See Ruby’s, Johnny Rockets, etc.) Unlike many of our chain diner and Vegas restaurant experiences, however, the service was terrific. The waitress was super friendly and seemed happy to help us navigate the wide array of burgers and shakes available. Yes, the “Steak” in Steak N’ Shake does not refer to steak in the traditional sense, as much as it does to burgers made with steak. It also refers to hot dogs made with steak, which we did not try on this go around. However we did try the burgers, and they were very good. I was a little concerned that a steak burger would not be as juicy as I normally like my burgers, but mine was moist and flavorful. There are a ton of toppings to choose from including their own chili, which is also available in little to-go buckets up front, all Tommy’s style. The fries are skinny, which I’m getting more used to, although I still prefer thick cut fries. Still these were tasty and not overly crispy. But the big thing here is the shake. I was at first dismissive of their shake menu online. It didn’t seem much different than what you could get at Ruby’s or Johnny Rockets. But I was wrong. So wrong. The shakes were thick and tasty, and S&S had a neat “side by side” option where they fill one half of your (GIANT) shake glass with one flavor and the other side with another. The result is you get a much more even blend of flavors than layer usually results in. I had banana and chocolate. It was really really good. I want another one now even as I am thinking about it. Lastly, it’s important that you know that they aren’t kidding about that 4 meals under $4 pricing on the website. I would take a wild guess keeping their pricing that low has kept them out of California, but the prices at Vegas were insanely cheap compared to the unpleasant surprises we’ve had at Johnny Rockets and Ruby’s. We fed 3 very hungry adults and a growing tween on less than $40 – a meal that included burgers, fries, and huge shakes, plus chili spaghetti (not as good as Big Boy’s, but not bad either). Even by Vegas standards, that’s really good. And it was more than enough to sustain us on our long car ride back to the land of $5 shakes. Sadness! 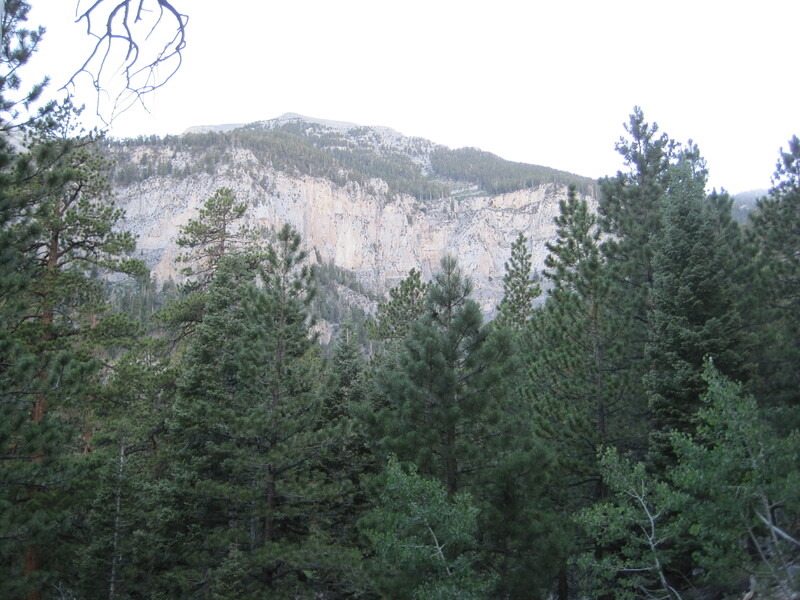 Comments Off on Steak N’ Shake – Mysteries of the Mid West… SOLVED! Before I explain anything about Slater’s to you, understand that this is a place where you’re going to pay $20-30ish a head to have a burger, a beer, and a side. Now, where I live, there is a lot of competition. In-N-Out, the Habit, Grill Em All, Tommy Burgers and Red Robin all come immediately to mind as eateries that are at the very least very competitive with Slater’s on a price point basis. I think most people would agree that Slater’s is better than In-N-Out, for instance, but is it 3-5x as good? This I am not sure of. But, now that that is out of the way, consider this review to be pricing blind. The toppings had good variety, though for comparison’s sake I will mention that gourmet burger rival the Counter seems to have a bit more variety, from glancing over their menu. Now, to step back, this isn’t a big deal for me personally since I like simple burgers anyway, but then again Burgandy wished for more varieties of jelly and I would have preferred some kind of chipotle BBQ. On the other hand, they do have a cheese sauce option, so I went for bacon, cheese sauce, and American cheese. Slater’s doesn’t seem too big on fries outside of an $5 appetizer – we ate in a group and almost no one had anything but the burger itself. I thought this was a bit of a gyp considering that you already paid for the burger and extra for the bacon and the alcohol isn’t cheap, but I guess it worked considering that the burgers were massive. We did spring for a couple of appetizers – the most notable was a quesadilla with cheese, bacon, and mashed potatoes that was almost as good as it sounded but a bit lacking in spice. Apple beer. Delicious. I believe it was $9 for a GLASS, though. Mashed potato quesadilla. I honestly really liked this one. But Burgandy did make a good point that it was very lacking in spice, or at least tasty dipping sauces. It also had to serve as a side since the burgers don’t come with them. That’s… basically it. And though I really liked my burger and it was as big as my daughter’s head, I still felt a bit gypped because given the price point and the wait. The whole thing took almost two hours, a long time for a burger without much else. Seems like you could at least get a soup or salad? Or at least some fries?